For 12 years, Falkirk FC outsourced the laundry of all garments worn by players, including kits, socks, bibs and waterproof jackets. The club’s kitman regularly had to haul the kit, often in busy traffic, to a laundrette and it was a lengthy and challenging task to make sure it was clean and ready for training and match days. Having little control over how items are laundered also meant that the club couldn’t decide for itself what detergent was used, or what temperature wash the kits should be laundered at. Falkirk FC decided that it was time to take a whole new approach to its washing requirements and make the leap to on-premise laundry (OPL). The first challenge was finding a space for a laundry room. Using contractors, the club made a storage room into an area suitable for washing machines and tumble dryers. When managers began looking for appliances, they came across local white goods supplier Thain Commercial, and as commercial laundry experts who also happened to be big football fans, they were clearly the right fit for the job. The club’s managers were looking for machines that offer programmes that specialise in washing muddy clothes. With this in mind, they selected two Miele PWT6089 washing machines and two Miele PTT7189 tumble dryers. Thain Commercial installed the machines in the new laundry room in a matter of days. With new machines installed, Falkirk FC’s kitman can now wash items as soon as the players are finished with them. As trips to the launderette are no longer required, the kitman can organise the laundry according to the club’s schedule of training, gym sessions and match days. Now in greater control of the laundry process, the club’s kitman can ensure clothing that gets muddied easily, such as t-shirts and shorts, is put on a specialist sports setting that thoroughly washes the items. Detergent choice is also now down to the club, so all kits comes out of the machines smelling fresh and ready for players to wear. Investing in OPL has proved to be a successful long-term financial investment for Falkirk FC. Removing the need to outsource laundry, the club is no longer faced with high laundry bills every week for the dozens of items the team uses. Willie O’Neil, kitman at Falkirk FC says: “While fans only see our players on match days, our players spend the week training to stay on top of their game. As a result, laundry is a daily task. Now that we have an OPL facility, I can wash garments there and then, making the process much less burdensome than when we were outsourcing the service. Luxury Marina moves into Leisure with Thain Commercial. One of Scotland’s finest marina and accommodation providers has developed a world class leisure experience, drawing on the expertise of Thain Commercial for its laundry solutions. Thain Commercial and the progressive team at Portavadie have established a fruitful relationship as the Loch Fyneside facility has grown and moved forward. Now that partnership has seen the development of a new laundry facility to cater for guests including those visiting the new leisure pool and spa - one of the finest of its kind in the highlands. Having used Miele washing machines before - recognising the reliability, durability and ease of use - the Portavadie team first contacted Thain Commercial four years ago when planning the initial phase of their laundry provision. “As a company, if we are investing in machinery, we always look at what is best and most cost effective over the longer term. Miele provides this,” says Iain Jurgensen, Portavadie General Manager. In the first stage, Thain staff consulted with the Portavadie team, establishing a solution to cope with anticipated volumes and linen types as well as producing the highest performance and energy efficiency. They also planned around the challenges presented by the temporary portakabin site. Miele’s range of slimline and stackable machines all came into consideration, enabling them to circumvent space restrictions whilst providing a laundry system which delivered the targeted benefits. The recent introduction of a stunning leisure facility, complete with hydro pools, spa pools, a gym and treatment spaces, however, has changed the game for Portavadie- and the requirements of their customers. Working with Thain Commercial, the company has installed an expanded laundry system, housed in a new purpose-built building. “The leisure facility is generating hundreds of towels per day so we needed to be able to handle that volume,” added Iain Jurgensen. “I was impressed with the level of research and detail that Thain Commercial provided for the project, working with our Guest Services Manager, Kim, on the development side and liaising with the architects." With the Miele machines installed four years previously still in excellent working order, consideration was given to continued use while adding new capacity in the form of a further 16KG, PW6167 Washer and PT8403 Dryer. With an eye to the long-term, the system has flexibility for the addition of further 16 kg machines, should the company wish to add further attractions for its customers. “What is pleasing is that Thain Commercial do not try to sell something which is over-capacity, in order to increase margins. Instead, they have been thoughtful of our business needs and respectful of our timescales in terms of pushing things forward,” added Iain Jurgensen. A company run by a Scottish sporting legend has secured a lucrative contract to provide infection-proofing professional laundry machines to two new multi-million pound Care Homes in the highlands. Thain Group, founded by Scotland Shinty star Kevin Thain, has been enlisted by Parklands Care Homes to service their state-of-the-art new-build sites in Muir of Ord and Tain. The award-winning Parklands group has invested £5 million in the newly-opened facilities and sought washing solutions to prevent infection and provide standards above those required by regulators, The Care Commission. The former Highland Council-run homes have been fitted with ‘intelligent' Miele Professional washing machines which hygienically clean themselves, as well as the laundry, plus gas sensor driers to minimise waste. The residents of the two 34-bed homes are now on-site and both Thain Group and Parklands believe the partnership will ensure the standard of care which befits the new facilities. Kevin Thain, founder of Thain Group, said: “This is a huge investment from Parklands in the highlands, with jobs created, and significant business for Thain Group. Both homes employ a dedicated laundry assistant and staff have been trained by Thain Group in how to use the high tech systems. Parklands Care Home Operations Director Elaine McIntosh said: “Things like hygiene and the care for residents clothes are highly important to us and this system sets the right amount of chemicals required and is foolproof when it comes to infection control. Parklands, which employs 450 people across the highlands and Moray, was voted the UK’s Most Outstanding Care Home Group in 2012. Moray Business of the Year last year, the group is to replace its Grantown-on-Spey facility this year and build a new home in Elgin. Thain Group was started in 1996 by Kevin Thain and is now the largest independent provider of Miele Professional systems in Scotland. Thain Commercial’s staff were approached by Rachel Payne, Operations Director, to offer advice and support in replacing the Nursing Home’s existing commercial laundry equipment. Rachel’s main objectives were reliability and energy efficiency. It was also imperative the washing machines and dryers produced effective results and complied fully with care sector regulations. Bandrum Nursing Home, an original 19th Century Lodge with purpose-built units in 19 acres of woodland near Saline, is dedicated to excellent care standards, family values and personal care. Our highly trained team assessed Bandrum’s requirements carefully. Reliable washing machines are essential in achieving the consistent high standards required in nursing homes and to minimise the risk of cross infection. They took into consideration that Miele engineers have developed wash programmes, through Profi-M control, that cater specifically for healthcare applications, ensuring UK directives and guidelines are met. The machines are also highly economic. Our staff provided Rachel and the Bandrum Nursing Home team with one Miele 13 kilo PW6137 Profi Tronic Washer and one Miele 16 kilo PW 6167 Profi Tronic Washer. Taking into account the need for reliability, efficiency and effective results, they also provided one Miele PT8333 Profi B Dryer and one Miele PT8503 Profi B Dryer. Northcare (Scotland) Ltd opened Three Bridges Care Home, a purpose-built 72 bed home, in May 2012. It cares for 36 elderly patients and 36 patients with dementia. Advised and guided by Thain Commercial staff, Three Bridges decided to install 2 Miele PW 6167 washer-extractors, drawn to their flexibility for a range of different applications. 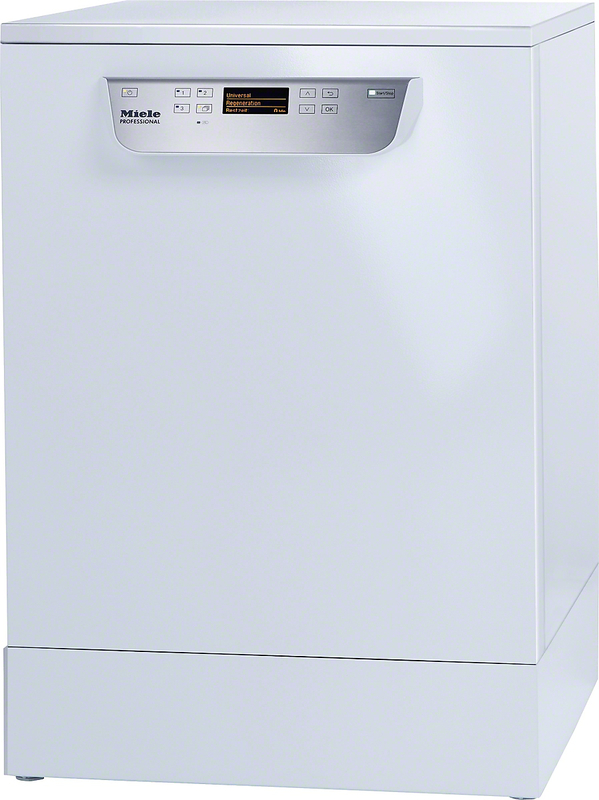 They also installed Miele PT8333 Dryers. Three Bridges have also installed an HM 21-140 roller ironer which perfectly complements the PW 6167 washer-extractor and the PT 8333 Dryer they have installed. Portavadie Marina is one of the most exciting new destinations in the UK, attracting sailors, holiday makers and food lovers to Loch Fyne in Cowal, Argyll, one of the most scenic areas in the world. Set in a man-made lagoon, situated on Loch Fyne, Portavadie Marina is one of the UK’s most modern marinas, with deepwater, sheltered berthing and stunning purpose built facilities. With the development at the Marina of luxury accommodation there was increase in laundry requirements. The management opted to process this in-house to be in complete control of quality and processing management. In the short term, a large portakabin was chosen to operate the new main laundry currently situated in the grounds. In addition to this there was also a requirement for small commercial equipment with token controls for installation in the luxury staff accommodation. Following a series of consultation meetings with Carol and Kim Atkinson, Portavadie’s Guest Services Manager, all requirements were qualified right through from linen types, anticipated laundry volumes to selecting the right equipment, whilst taking into consideration performance, reliability and energy efficiencies. One of the challenges was installing the machines in the portakabin, where space and layout had to be considered. Although this was such an exciting project, the installation proved to be challenging due to space restrictions. However, with Miele’s range of slimline and stackable machines to choose from this ended up being a very satisfying and successful installation. Following discussion with architects the floor plan and services upgrade plan were drafted. Services installed – machines delivered, installed and commissioned. Among the installed products were Miele’s new SlimLine Range PW5105 Washer and PT8303 Tumble Dryer, along with the Miele Octoplus 8 kg washer and dryer, PW 6080 and PT 7186 and also Little Giants PW6055 washer and PT7136 dryer with token control. “The partnership between ourselves and Miele means that we strive to satisfy, not only with the products but our customer service levels too, using Miele products we were able to offer Portavadie “affordable quality” an ethos that clearly runs through Carol’s company – job done.” Scott Falconer concluded. The Daldowie Fuel Plant operated by ScottishPower subsidiary SMW Ltd was commissioned in 2002. The plant operates under a PFI agreement between ScottishPower and Scottish Water and processes sewage sludge from the Greater Glasgow Cathchment area by drying to produce waste derives fuel pellets known as WDF; this WDF can used in electricity generation. The Daldowie facility is one of the largest sludge drying plants in Europe. Annually SMW Ltd treats around 2 million cubic metres of liquid sludge to produce around 50,000 tonnes of WDF. Thain Commercial were commissioned to design, plan and implement a laundry solution for the plant facility – providing a solution for laundering effectively – overalls, personal protective equipment and also personal clothing .